Bionomic Industries, a worldwide leading manufacturer of cutting edge scrubber system technology, has recently developed a device that improves the level of ethanol removal and entrainment capture in existing ethanol plant wet scrubbers designed to control vented fermentation off-gases consisting of ethanol and VOC vapors. In many cases, the original CO2 scrubbers installed as part of the gas cleaning system did not meet required ethanol capture requirements, and/or are emitting entrained water droplets that cause damage to the system's thermal oxidizer ceramic media, requiring costly replacement and lost production time. Known as the OXESAV, this new device employs a proprietary two stage gas cleaning and separation process to resolve these problems through easy retrofit in existing scrubber exhaust duct work while eliminating the need for a complete and costly scrubber system replacement. OXESAV is designed with no moving parts that often require routine maintenance or replacement. 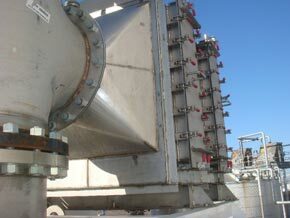 In a recently installed system designed to handle 10,000 acfm, the OXESAV device was mounted at the outlet of an existing CO2 scrubber exhaust duct where its two stage treatment process easily polished the ethanol emissions and removed entrained water droplets with extremely satisfactory results. Results were achieved utilizing a minimum amount of cold water, precisely calibrated with an alternating spray arrangement and separation path, to eliminate or minimize additional plant water usage. Targeted reduction of ethanol emissions was met and protection of the sensitive regenerative thermal oxidizer media was also achieved.